The LiteTouch Laser Facial™ is a elite-level clinical skin care treatment that combines several of the most modern treatment options into a single, customized, and highly advanced session that addresses nearly every potential concern that a man or woman may have with their skin. Do not allow the term “Facial” to skew your expectations of this treatment. It is in fact a real clinical skin care treatment in every sense of that phrase, and is always performed by the doctor. That is not to say that the Laser Facial isn’t relaxing and enjoyable, because it certainly is. Keep in mind the LiteTouch™ brand name attached to the title as it holds true with Dr. Vendemia’s gentle hands and attention to the details that make such an advanced treatment so comfortable. The Level I laser facial is a single-session treatment that is all about improving the texture of the skin. Within 3-6 weeks after treatment, you can expect smoother, softer, brighter skin with smaller pores and less superficial imperfections. The skin is first prepared with a glycolic acid mask, and then completely exfoliated with 2-3 gentle chemical peels of increasing strength, and then again with a thorough session of macrodermabrasion. The pH of the skin is then neutralized prior to the laser component of the treatment. A series of 2-3 passes with a non-ablative, fractional resurfacing laser with settings customized to the specific condition of your skin, is then conducted, followed by another 2-3 passes targeted to problem areas. The Level I session lasts approximately 60 minutes, and ends with a hydrating mask that decreases the temperature of the skin and starts the healing process right away, followed by a 5-10 minute period with a soft ice mask. Expect your skin to have a pink appearance (similar to a mild sunburn) for about 24 hours (or less), followed by a 2-3 day period of very mild flaking (also similar to a mild sunburn). Choose the Level I treatment if you feel that your skin is dulled by large pores, overactive oil production, mild acne scars, or any other common skin problem that is related to the texture of your skin. Click here to learn more about the fractional laser resurfacing technology used in this treatment, or keep reading to learn about the Level II treatment. Broken capillaries, small capillary hemangiomas (also called cherry hemangiomas), and small red vessels at the corners of the nose are the most common examples of reds that can be treated with Level II. Smaller, blue nasal veins are a good example of blues that the Level II treatment can address. Sun spots, sun damage, and naturally occurring, long-standing, and unchanging freckles will improve with the Level II treatment. Expect your skin to have a red/pink appearance (similar to a moderate sunburn) for 24-48 hours, followed by a 2-3 day period of mild flaking (also similar to a moderate sunburn). Most Level II patients do not find it necessary to take any time off of work since the redness and flaking can be covered up with makeup fairly easily, but this is not a “lunch break” type of treatment either. Choose the Level II treatment if you have any of the color issues described here, but also want the texture benefits of the Level I. The Level II starts and finishes the same way as the Level I, but takes about 30 minutes longer because of the addition of OPL. Plan on a full 90 minutes of treatment time for the Level II, followed by a second 30-minute follow up OPL treatment 3-4 weeks after the first session. The Level III treatment is the same as Level II, with the exception of the intensity. Level III is for men and women who are very serious about their skin, and who want the most dramatic results possible in the shortest amount of time. The treatment takes just under 2 hours, starts and finishes the same way as a Level II, but the recovery period is a little different. Expect red skin (similar to a moderate-severe sunburn) for about 24 hours, followed by 2-3 days of pink and sensitive skin, followed by 2-3 days of moderate flaking. Blisters and scabs are NOT expected after a Level III treatment, so for most patients, having the treatment on a Thursday or Friday before a weekend off is plenty of healing time. If you have any of the above issues, it’s best to start with a skin care consultation to determine the best treatment plan. Once advanced problems such as these are treated with a more targeted therapy, your skin will then be ready for a maintenance treatment like the Laser Facial. Let your doctor know if you are on Retin-A, or any other harsh skin care products. Let your doctor know if you are taking Accutane currently, or have been on Accutane for any period of time in the last 12 months. Let your doctor know if you feel that your skin is far more sensitive that what you would consider to be an average level of sensitivity. Let your doctor know if you have permanent makeup around your eyes or lips. Let your doctor know if you are prone to cold sores. Your skin will be bright red or pink (like a sunburn), and slightly swollen, for approximately 4 hours afterwards, and then slightly pink and flaking (like a mild sunburn) for the following 2-3 days. Your skin will be slightly sensitive and dry for a few days, so plan on applying a good moisturizer before bed, and a high quality clinical sunscreen that contains Zinc Oxide under your makeup. If you had a Level II Laser Facial to treat freckles or sun damage, your spots may darken considerably for a few days and will then start to lighten or even flake off completely. A little concealer can easily cover all but the darkest freckles during the darkening phase. If you had a Level III Laser Facial, you can expect all of the above to be slightly more exaggerated and last a few days longer (but the final results will be that much more outstanding!). This is a real patient who had a Level I Laser Facial. The first photo was taken immediately after the procedure, and the second photo was taken after 20 minutes of icing and then applying sunscreen and normal makeup. You can see that her skin is ever so slightly swollen and red, but the redness begins to dissipate very quickly and she looks perfectly reasonable to be out and about with a quick application of a gentle mineral makeup. If you’re ready to take the next step, please call our office at 917-703-7069 or contact us online to schedule a personalized skin care consultation. If you haven’t already done so, check out the amazing results in our Before & After Laser Skin Care Photo Gallery. 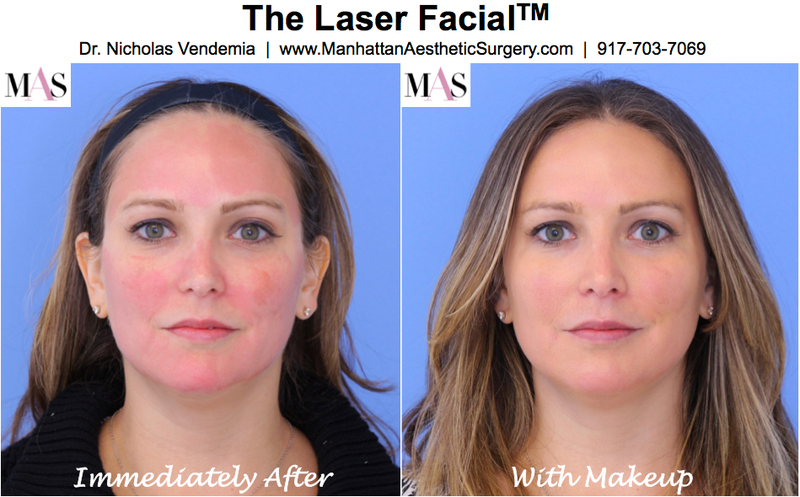 Are you considering laser treatments in New York? We offer the most innovative technologies and the quickest recovery times, and all treatments are performed by a physician for added safety and comfort. Please feel free to contact us online or call our office at917-703-7069.